Hekab Be Biblioteca ~ Open Road Community Library: Season's Greetings to everyone! Last Thursday Nov. 29th was the last day of our free Adult English Classes. We have had a wonderful time teaching and getting to know our students better. Their progress has been remarkable! We celebrated this past Monday the 3rd with an official graduation ceremony complete with frame-able certificates and *Bilingual dictionaries for the graduates. 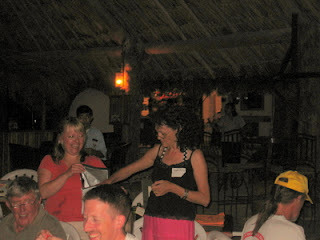 After the official business we celebrated with guests and family members a Mexican feast. We had great time! *These Webster´s Spanish-English Dictionary´s were provided by the Mountainside, New Jersey Rotary Club- special thanks to Glenn for arrangements. We began this month with our ongoing Painting Classes (free) for our older students of the library. Local artist Juan “Indio” has been so pleased with the results and the enthusiasm of his artists in training that he has offered to teach the class indefinitely on Saturdays from 12:00 to 2:00. These art lessons are so important, as the local public schools do not have the curriculum and/or the support to offer any type of music or art classes. If anyone is interested in volunteering and assisting Juan with the Painting Classes please contact us – we always need volunteers! THANK YOU to all of the Loco Gringos who supported the library both financially and materially last Weds the 28th of November at Lol Ha. Once again Loco Gringo forum members have “come through” for us with their incredible generosity. Special thanks to Debbi2000, Wifey, Canusa and Lady-bug for organizing the event. And as always a huge thank you to Shapeshifter & Maplesyrup for donations of original artwork for the raffle. Thanks to all our library friends & supporters!!! *****Another special thanks to all of the Great Loco Gringo and Palladium Addicts members who have come by the library this week bringing literally bags full of Christmas toys for our annual Fiesta. Thank you to Scott, Deb, Kari and Sharon (Iowa Two), Mary and Duane and Pam & Eric of MI, Mark & Karen Barnet, Nolin Lise & Jean-Pierre (Miss Piggy) Ward, Julie, Colleen and Brynn Imbeau, Adam & Erica Dial, Maria and Harry Schonert, Steve and Judy Holtz, Jane O´Meara and the Pretzer, Shore and Aschim´s Families. We have many friends of the library coming and going this Month – Special thanks to Ralph and Ladybug, Debbi and Frank Burke, Sherwood and Bob Anders, Jean and Don Pfifer, Bob and Diane Mathers, Wendell and Linda Day, Bud & Alice Blatner and as always Allyn Pappagay for all of his handyman assistance! I just love reading your blog. Keep up the good work.